I flew my Noise 12m kite for the first time today. Yes, its taken me quite a while to get around to it. With such as poor wind season I have opted a couple of times to use my Switchblade 14m instead. After flying the Noise, I realise this has been a mistake. The kite is superb. It flies like a dream and turns much faster then the Switchblade 14. The bar pressure is good, enough to get good feel, but not too much. The southerly change after a 40C degree day came through at 6pm as forecast. I got on the water at about 6:30, by which time the wind had dropped, making the 12 a good proposition. The Noise 12 bladders are much smaller and quicker to pump up. This lean profile would be one reason the kite flies so well. After launching me, a friendly kiter pointed out that I should cleat the depower line to avoid the plastic stopper getting torn off. The kite really wants to fly, but it is predictable and sweet to turn. I tried a small jump and even in the light 15 knot wind I got some boost. I stayed out for a while and picked up some short bursts of good wind, then it dropped so I came back to shore. I didn't quite make it to the second groyne beach and ended up on the third, which is a dicey place to come in. The reefs just offshore have leg-swallowing holes in them (which I avoided) and some line grabbing rooks in the shore break (which I got some lines caught on briefly). The beach is narrow too. Next time I self land, I will do so along the sand rather than from the water. It took me a while to untangle the lines, but I headed home happy. A summary of my initial impressions of the Noise 12m kite by Benwilsonsurf. Looks like my Switchblade 14 will now be for sale. I visited Sydney last weekend for a conference. I travelled light so I didn't take my kitesurfing gear. After the conference I visited the Northern Beaches with my friend Dean who lives there. We stopped briefly at North Narrabeen where I took these photos of local kitesurfers in action. There was excellent wind, so I was surprised how few there were out on the water. I didn't see kitesuring anywhere else, certainly not on Sydney Harbour. It was great to get out on the water after a weekend in Sydney with no kiting. The wind was good when I arrived and for the first half of the session, then it dropped off. I am finding it difficult to gibe. Today the board stalled and sank under me while I was wondering what to do with my feet. I need to do some more practice on the beach of the foot movements, and bring my rear foot right up close to the front one before attempting it. Wow, is it really 2 weeks since I last kited? It has not been a very good season here so far this year. 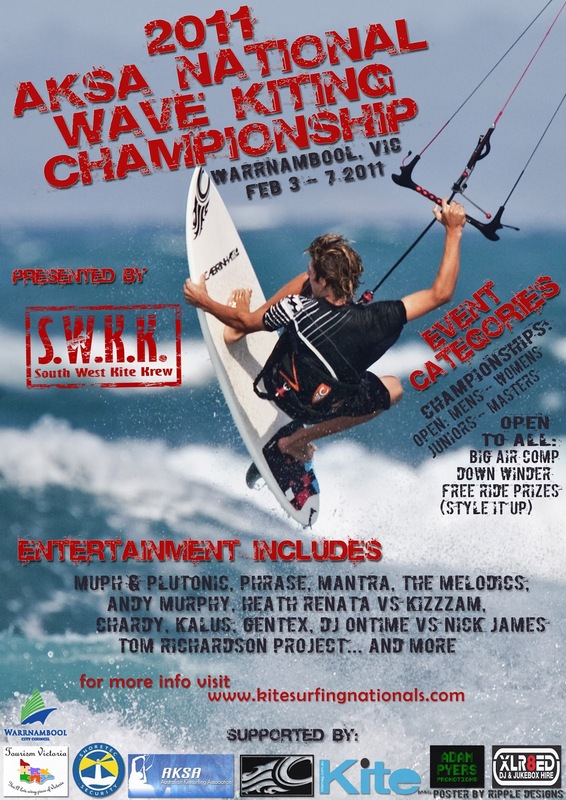 The 2011 Wave Australian Nationals are coming up quickly, check out http://www.kitesurfingnationals.com/ for details. It is likely to be a fantastic showcase of the best surfing with a kite talent in Australia, so get along to the event if you can, to show your support. Email your local state kitesurfing association or info@aksa.com.au to check if you are qualified to represent your state at the nationals. I intend to go for at least a couple of days. We got lucky with the wind today. I met Stuart at Seaford at about 3:15pm. There was a gentle breeze blowing on the beach which picked up occasionally then dropped. After some consideration, we decided to give a downwinder a go. I packed my backpack with the kite bag, foam sandals and money, then waited offshore while Stuart self launched his kite on the narrow beach. We got going in the light wind and spent about half an hour doing kiteloops left then right to keep our speed up. The wind was stronger further out, and the water near Seaford is a wonderful clean green colour. The beauty of a downwinder is you get time to look around and try some new techniques at your leisure. 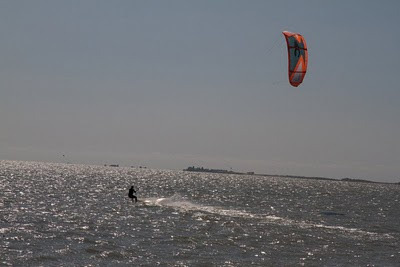 I found I was able to ride toeside quite effectively - it is good to get this perfected - along with carving both left and right turns under power and keeping the kite flying fast. Very satisfying. After passing one kiter of Aspendale then the Mordialloc pier, we were considering finishing our run at Mentone, but the wind picked up, so we headed for Ricketts Point on a tack, passing just outside the oyster farms to get there. Crossing this small "bight" was easier and less daunting than I anticipated. When the wind is zinging you along at 20+ knots nothing seems to be a problem. We came into to Beaumaris beach on a tack then continued on, getting some real speed up on fast downwind reaches. There was enough wind to pop some jumps off the waves too. We tacked in close to the HMAS Cerberus wreck. Its a pity this wonderful old ship is being left to rust away to nothing. There are very few iron clad monitors left in the world, and this one is disappearing fast. I raced a large launch for a short distance. 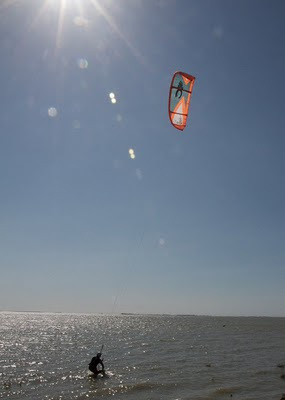 My kite was almost keeping up with it, then I rode some of its large wake waves and got in the calmer water of its wake. The spreader bar on my seat harness unclipped a couple of times while riding toeside which was annoying. Even though I hard the harness done up tight. The only easy way to reconnect it is to land the kite on the water to take the tension out of the lines, then pull it back together. The seat harness is actually OK going downwind apart from this problem. I might rig a buckle or strap to secure it. We landed at Hampton where I spoke briefly to Rick who was kiting there with about 6 others. Stuart and I decided to head on to Middle Brighton which is closer to the train station. Leaving the beach someone body dragging released their kite which looked like it would fly onto Beach Road. Rick sprinted after it and grabbed it when it luckily landed leading edge down just before the embankment. Hampton is not an ideal place for beginners - there is not a lot of beach and the rock groynes loom large. We got to Middle Brighton and landed our kites on the wider sand section close to Green Point, packed up then caught the train to South Yarra then back out to Seaford. This downwinder tour is highly recommended. We were both weary but very satisfied to completed it. The strong northerly that blew all morning was replaced by a stronger southerly that came in mid afternoon. It looked like conditions might be a bit dicey, but I was keen to get in another session after the last several days on the road in South Australia (and only one kiting session). It was a toss up between the 7m and 10m kites. It looked about 25 knots so I took out the 10m Switchblade and my twin tip board. The wind was quite gusty at times but always strong. It was incredibly easy to go up wind, and launching off the waves was almost unavoidable, even with the kite fully depowered. I headed out and back towards the breakwater, then surfed a few swells and did some jumps to get into the surf zone between the rock groynes. It was good fun surfing these swells in short out and back tacks, with two other kiters in the same area. There were lots of windsurfers on the water today, but not so many kites. There were several on the beach, with many deciding (wisely) to avoid the strong frontal wind. On one tack to shore I ditched the kite as I surfed with speed towards it. It was getting caught in the waves, but I relaunched it a bit too hot - it flew across the wind and dunked into the surf with tangled lines. Relaunching here was not really an option as broken waves were catching the kite and threatening to rip. I released my safety and washed in. Another kiter grabbed it at the shore which was nice. The wind seemed to be getting even stronger so I decided to call it a day, having well and truly got my money's worth. While packing away, another kiter got his kite tangled at the top of the bank, so I went over with some others to assist. It was definitely not a good day for beginners. Thinks can happen (and go wrong) very quickly in strong winds. I got some nice photos and video of the riders who just went out as I was leaving. Big air on surfboards! On our recent road trip to South Australia, this was the only kiting session I managed to score. 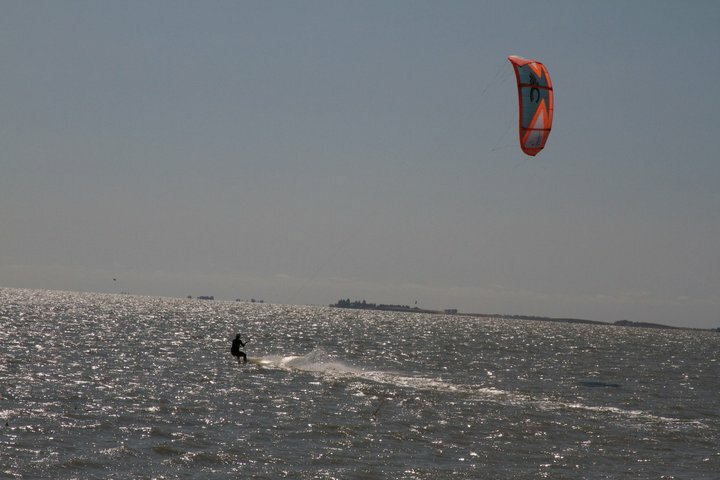 It was very different kitesurfing in Lake Albert (near the Murray River mouth) in freshwater. The grassy launch site just north of the town of Meningee was a bit confined but worked out o.k. There were a couple of fishing nets strung out under small buoys which I had to watch out for. Other than that, I was powering out through the small chop and then screaming back to shore. I popped a few small jumps, but was cautious. It was shallow close to shore and it would have been a giant swim back from the middle of the lake. This good sea breeze was blowing across the Coorong lakes and also the beach at "The Granites", so kitesurfing would have been possible at other venues on this day too.